I often find that when I travel, the adventure is not about what you saw or did. Rather, it is about the people you connected with while you found adventure. George (a lot of men are named George in Georgia, apparently) acquiesced to our request and ensured that we were well and truly acquainted with his favorite types of wine. He acquainted us with 'wine meditation' as being one of the most important activities in Georgian culture. "In order to really meditate...you must drink lots of wine." Done and dusted! I think I will put that on my resume, wine meditator. It has a nice ring to it. "As you wish, when you wish, how you wish"
Georgian hospitality was really in play here, he sat us down and kept the refills coming - letting us sample many of the different types of wine that he had to offer in his shop, he also ensured that we tried CHACHA - a liqueur distilled from grapes that is popular in Georgia. Between shots of CHACHA and toasting our spirits, he shared his views on the Georgian people and his beautiful country. He had nothing but love for his homeland and it was infectious to say the least. 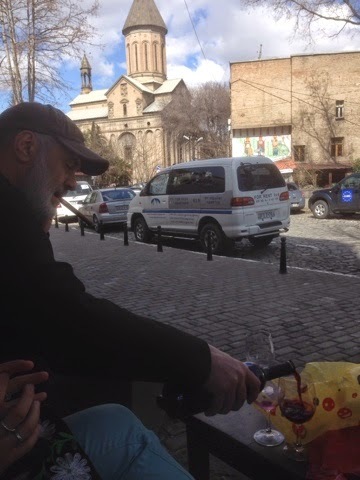 He truly belived that love is the religion in Georgia, that it matters not where or how you pray, but what matters most is that you are Georgian, and you love each other. A day well wasted, and an experience I wont forget.